His father, Edward Frost, came to America on March 23, aboard the Enoch Train to Boston. From there to New York and so on to Iowa City by rail. He came to Utah in 1856 with the first hand-cart company. On June 15th, he addressed the Sunday afternoon meeting. Edward Frost traveled south with the pioneers when Johnson’s Army threatened Salt Lake City and he purchased property in Fillmore. It was in Fillmore that he and Mary Allsop Scottern were married. She became his third wife and at the same time, the second wife in a plural marriage. Edward was made one of the Seven Presidents of the Seventies there in Fillmore and is said by the family to have completed two missions in England. He was considered to be quite well off financially. Mary Allsop Scottern was baptized in Nottingham, Nottshire, England on February 15, 1857. She was baptized along with her mother, Mary Allsop Scottern, and sister Harriet. The Nottingham Branch records say that her sister Harriet died on that day. Her mother’s church records seem to have been lost after that time. The first Mary Allsop Scottern was at one time in her life a Lady-in-Waiting to Queen Victoria. Mary Allsop Scottern (the second) sailed to America on the George Washington and then continued her journey to Utah traveling with the 6th Handcart Company in 1857. She married Edward Frost in Fillmore, Utah, on September 4, 1858. They were sealed at the house of Lewis Bronson in Fillmore. 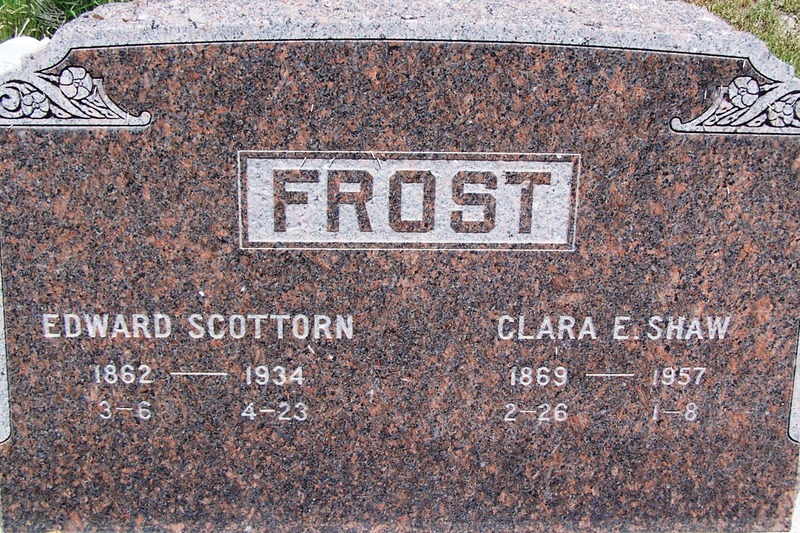 This couple had two children, Maude Mary Frost, born on August 8, 1860, and Edward Scottern Frost, born on March 6, 1862. The birthplace of both children is Fillmore, Utah. Edward moved this family to Grantsville, where they established a home and it was at Grantsville that he died on November 7, 1870. Edward Scottern was only eight years old at the time. The Grantsvillle cemetery lists him as having been buried on Lot F4 #5. His grave was unmarked until about 1985 when a descendent of his from the second wife installed a headstone. Some of the Grantsville families apparently heard about Grouse Creek and moved north to homestead and establish a home in that valley. Edward Scottern Frost was one of the interested people who came. It is believed that this is why Edward was able to make the acquaintance of one Miss Clara Elizabeth Shaw. Grouse Creek was where her family settled when they emigrated to Utah from England. Edward and Clara’s wedding took place in Tooele on May 11, 1886. He was 24 years of age and she was 17. Edward Scottern Frost settled on the natural meadows about six miles north of the bench which is the town site and on which the church house, school, etc., are built. This meadow became known as the Frost meadows. Later he built a new house located approximately two miles north of the town site. Edward was a good, hard-working man and was well respected in the community. One of the ways that he earned a living was by raising sheep. For reasons unknown, Edward Scottern became inactive concerning church service. Nevertheless, he donated of his means to all worthwhile causes that came up within the community. During his later life, he started attending church once more and was endowed on February 15, 1934 in the Salt Lake Temple. Edward died on April 23, 1934, of heart failure at the age of 72 and was buried in the Grouse Creek cemetery.